Ogaki has been blessed with rich groundwater from ancient times and is called the "city of water". The specialty created with this fine water around the end of the Edo period and early Meiji period is called "Mizumanju". This is an unbaked Japanese sweet, made with bean paste wrapped in kuzu starch and cooled with water. It has a distinct smooth, slippery texture, pleasant to the tongue. The scene of them on display in water is cooling to the eye, and has long been a summer tradition. 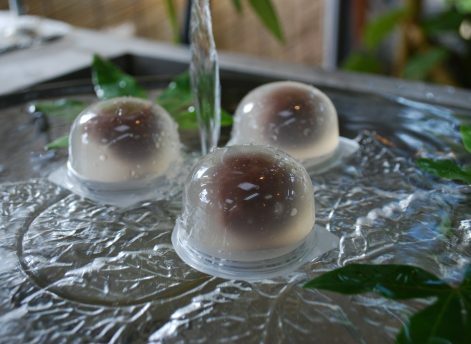 Kinchodo Sohonten's Mizumanju are sold in transparent plastic cups so that customers can "feel" the coolness by looking at them, as well as enjoy the fun moment of removing the confectionery from its container.The strained bean paste in the filling is nicely sweet, which perfectly balances the refreshing kuzu. ＜Messages from the Staff＞ Mizumanju is a specialty of Ogaki. Each store offers their own Mizumanju with confidence. Come and visit Ogaki to try them. The signature item, "Kincho Manju", has a smooth texture and a soft, gentle taste. A long-established Japanese confectionery shop founded in 1805, surrounded with a tranquil atmosphere. It is exhilarating to slide a Mizumanju out of its cup with a toothpick. The amazing pear flavored Mizumanju is also wonderfully juicy.